Place cinnamon, cloves, allspice and orange zest on large piece of cheesecloth; tie into bundle. Bring water to boil in large saucepan on high heat. Add cheesecloth bundle, sugar and raisins. Reduce heat to medium. Add tomatoes; simmer 10 min. Remove cheesecloth bundle; discard. Stir vanilla into tomato mixture. Remove from heat; cool 5 min. Spoon into large serving dish or eight individual serving dishes; cover. Refrigerate several hours or until chilled. 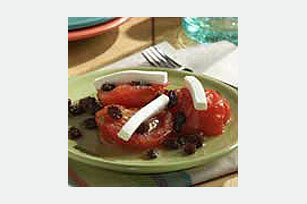 Just before serving, cut cream cheese crosswise into 12 slices; cut each slice into 3 strips. Top each serving with 3 of the cream cheese strips. For more intense vanilla flavor, substitute 1 piece vanilla bean (3 inch), halved lengthwise, for the vanilla. Add vanilla bean to cheesecloth bundle.